Back in my beloved house painting days, I was working on a big house for an elderly lady who was a true gentlewoman. It was the summer of 1979 and it was hot. Marilyn had dropped by on her way home from her prenatal visit to the doctor. I climbed down off my ladder to hear the news. Marilyn was due to deliver soon and I wondered what the doctor had said. We were planning our second home birth….so when Marilyn drove away, she agreed to call me immediately if she had any strange sensations before my regular time to arrive home. I saw Mrs. Holt, my customer, a few minutes later. When I told her it looked like a new one would be along soon, she smiled. And I was. And I am. But it’s striking how often I forget and have to be reminded that I really am wealthy. Sometimes, I feel sort of poor. I’ve long suspected that whoever said that the best things in life are free never paid an obstetrician’s bill! Looking back on our marriage, we see so many times when we wanted to know why the pressure was on us and whether it would ever end. It would be very gratifying to think that those trials were partly for the purpose of preparing us to share hope with those who come behind us. We see the past through rose-colored glasses to some extent, but still we have a pretty good memory of how it was. The future we see as through a glass darkly, but we have our experience to give us some idea what it will probably be like. It’s usually the present, or at least some features of it, that’s hardest to focus and examine. When I was a boy, my cousins, brothers and myself used to swim in Grandad’s muddy pond in the back pasture. There were cows in that pasture and the pond was their watering hole. It sickens me to think of swimming in that water now, but you know how boys are. We loved it and that smelly mud just served as something to soften the pond bottom and as ammunition to throw at each other.But one thing we couldn’t do in that muddy water was see anything. Once I was swimming under the water trying to sneak up on somebody when my hand struck another hand in the mud of the bottom. Aha. Somebody was trying to sneak up on me at the same time. I grabbed the hand and gave a jerk, hoping to startle whoever was on the other end of it, maybe even assist him in swallowing a little water. But the hand wasn’t attached to anything. I panicked. I managed to get my feet under me and scramble to a standing position in the waist-deep water. I had just enough breath left in me to give a terrified shriek as I threw the hand halfway across the pond. It was a frog. The boys all laughed at me just as you’re laughing at me now, (shame on you), but you would have thought it was a severed hand, too, if you’d seen as many scary movies as I had. Visibility in the agitated water of a farm pond is not good. So it is with some of the stressful situations of family life. When you’re outside the pond, you can tell a lot about it and you can see plainly that it’s not all that far across. But when you’re the one swimming underwater in the middle of it, all you know is that you’re getting very short of breath. One of my favorite passages of Scripture is Ecclesiastes 3:1-8. It’s a good reminder that good times and bad times come and go and that we need to be prepared to experience some of each. Rick Boyer wears many hats. Parents know him as a speaker/author who tackles the challenges of parenting head-on.He offers practical, effective solutions based on Scripture and over 40 years of parenting experience.He and his wife, Marilyn are the authors of many popular books on parenting as well as the Bible-based Character Concepts curriculum. 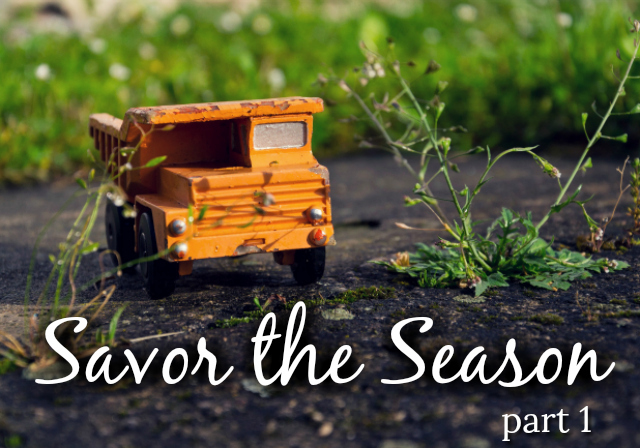 This entry was posted in Encouragement and Wisdom FOR Parents, Parenting, Parenting Series, Parenting Topics, Savor the Season and tagged children, dads, fatherhood, homeschooling, Parenting, rick boyer, savor the season, seasons of parenting by Rick. Bookmark the permalink. Very interesting post and so true.